Maybe you’ve seen it. There’s a piece circulating online with the title “How Pinterest is Killing Feminism”. Avid pinner and fellow feminist myself, all it took was the title to get my attention. My first reaction was anger. Then, I was insulted. How dare they make such an accusation about my beloved pasttime? The article sat unopened on my computer for a whole other day. On several occasions, I would click open the tab, look at the title, and then close it again. It wasn’t until the next night, when I actually decided to sit down and read it over. Pinterest promotes “thinspo”, and therefore eating disorder behavior. TRUE. “Thinspo” = thinspiration. Translation: those photographs of ridiculously attractive, skinny women used as inspiration for losing weight. The problem with such pictures (besides the obvious fact that they perpetuate very narrowly defined notions of style and beauty) is that they glorify such “thin-ness” as something that is both desirable and attainable for all. They leave you with the dangerous notion that perfection is always just five pounds away. Pinterest’s most popular pins are “diet” recipes. FALSE. It is true – there are a fair share of “diet” recipes, which can be found on Pinterest (clearly evident by the calorie counts and WeightWatcher points in their descriptions). However, are they in the majority? Hardly. Decadent desserts, cheesy chip-n-dips, and creamy pastas dishes are the real winners on Pinterest – getting hundreds of repins and favorites along the way. The stereotype that all women care about are “diet” recipes? It’s simply not true. Pinterest is about trying to achieve the impossible. DEBATABLE. I’ll admit it. Pinterest is a place for the dreamers. The dream wedding, the dream house, the dream body… it’s all there. What’s also there though? Dreams for gender/racial/sexual equality. Dreams to end intolerance. Dreams about fixing social problems like hunger, homelessness, and unemployment. 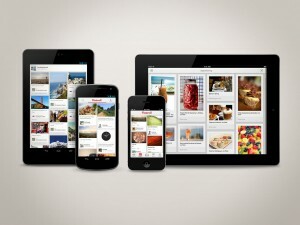 Pinterest is about trying to achieve the impossible – but that’s not necessarily a bad thing. Pinterest emphasizes interests like cooking, home decorating, and fashion, which work to perpetuate traditional notions of femininity and materialism. FALSE. Commercialism is alive and well in the United States. I didn’t need Pinterest to tell me that. However, the part about perpetuating retrospective notions of femininity? That part I take offense to. There’s no reason I should be considered any less of a feminist simply because I like baking cookies. Feminism isn’t about telling women what they can and can’t be. It’s not about telling women that they’re not allowed to like fashion, or cooking, or do-it-yourself crafts simply because to do so is “anti-feminist”. Feminism is about rejecting the notion that women always ought to be one way or another. The truth of the matter is that one in five women over the age of eighteen are on Pinterest. Over 60% of site visitors of Pinterest are women. We should embrace the fact that Pinterest is a female-dominated platform (and a rapidly growing platform at that – over 22 million new users in the last year alone), and harness this power to our fullest advantage. Many organizations that I follow, such as Miss Representation, WAM! Women, Action, and the Media, and NIU Women’s Studies, have already jumped on the bandwagon and currently use Pinterest as a means of transmitting information and spreading awareness on a whole variety of women’s causes. Pinterest allows such organizations the opportunity to reach an audience that they wouldn’t often get to reach. Just this summer, the SISGI Group itself started its own Pinterest as a tool for spreading its message through pins connecting to blog posts, webinars, and conferences, all which work to promote the ideas of feminism to the greater public. Upon finishing the article, I closed the tab and decided to open a new tab. My new search? Under the key words “women’s rights”, I wanted to see what kind of results the so-called “feminist-killing” Pinterest would bring. The results? Quotes about female empowerment. Statistics outlining gender discrepancies in the workplace. Stories dedicated to the “Half the Sky” movement, which took place last week. Images pinned to boards with titles such as “Make the World A Better Place” and “Power to the people! The fight for equality”. Still think Pinterest is killing feminism? Think again. Kristen is a senior communication major, sociology and psychology minor from Villanova University. Kristen's interest in social justice began shortly after arriving at Villanova in 2009. She has participated in many different volunteer opportunities like Special Olympics, Bigs and Littles, and an after-school program in Philadelphia during her time at Villanova. She has also participated in multiple service break experiences to Kentucky, Alabama, and Costa Rica to confront issues on everything from homelessness to environmental sustainability. Kristen was a Program and Research Intern for the SISGI Group for the summer of 2012, and will continue to write articles on issues of advertising, the media, gender, and education.